Each year — as long as a snow storm doesn’t ruin it (some of my family lives 2.5 hours away) — I invite my mom, sisters, aunts and cousins to my house for a cookie decorating party. It started out as a cookie bake, but that seemed crazy with one oven, 5 or 6 different cookies to bake, and everyone’s travel time factored in. So I modified the event. Now, attendees bring a selection of baked cookies and I make cut out cookies. We decorate the cookies, then have lunch, and everyone shares the cookies they brought and takes home some of the decorated cookies. This year, I made gingerbread cut outs, sugar cookie cut outs, and shortbread cut outs. My uncle is allergic to eggs, so that’s the reason for the shortbread cookies. 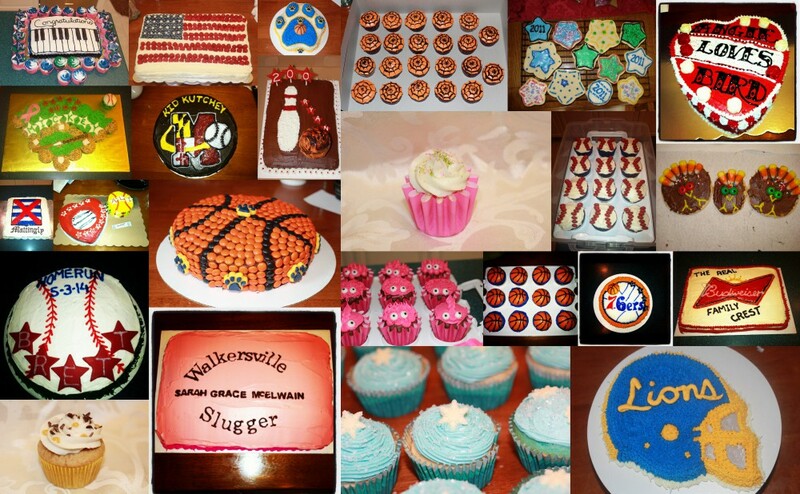 I provide the icing and decorations. Once we finish decorating the cookies, we have lunch – typically deli meats, cheeses, and the fixings for sandwiches, along with potato salad, pasta salad, and fresh fruit. After lunch, we divvy up and package the cookies everyone brought so each person can take some home. By that time, the decorated cookies are dry enough. This year, the cut out cookie shapes were Christmas trees, stockings, rounds, candy canes, bells, snowmen, and gingerbread men. Here are the cookies up close, as well as a shot of the whole table full. …and this clever creation – she even broke off the leg. Oh Snap! indeed. 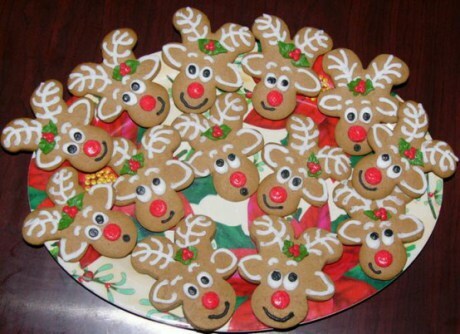 Sami and I decorated a bunch of cookies, although I did the most decorating. She focused on a few cookies, but spent a good deal of the time eating the decorations right out of the containers. I was able to send her back to her dad all sugared up! Sami had a great time. That green smile is from eating all the decorations! And so did I. Every year, it’s a tradition that means a great deal to me. Two of my former colleagues and I try to meet for lunch once every other month. We pick a restaurant, based on the alphabet and get together to catch up. We’ve already been through the alphabet once, and are back to the letter A. We had plans to get together today (December 10) for our Christmas lunch. But Mother Nature had other plans. We all work at Associations that follow the government operating schedule. Because the government closed, none of us were at work today. But I was ready with gift baskets for both of my pals. 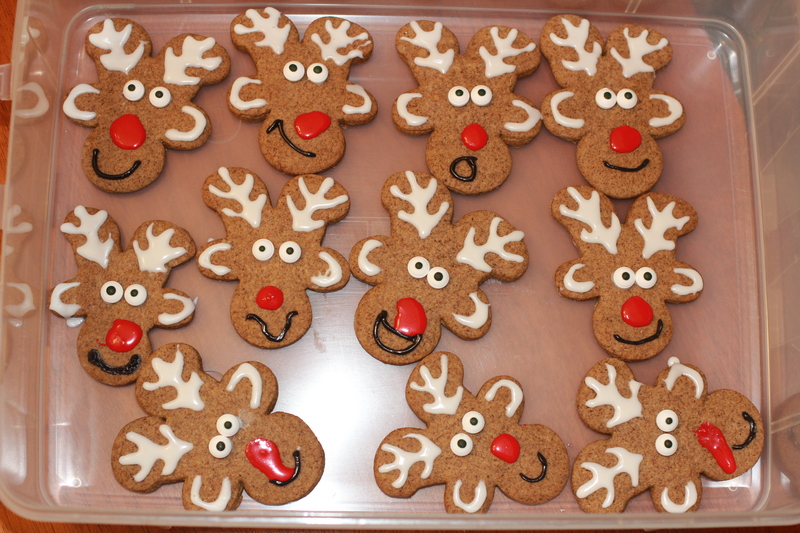 They included Snickerdoodle mini-breads and reindeer gingerbread cookies. 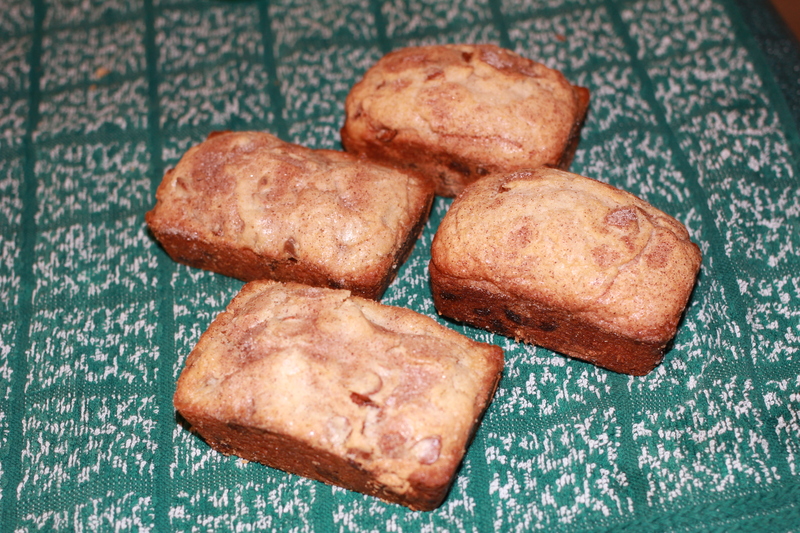 The Snickerdoodle bread recipe is a good one, but sometimes the cinnamon chips are hard to find unless it is the holidays. I also think that this bread is good when it is warmed up in the microwave (10-15 seconds if it’s a slice of the full size loaf; 20-25 seconds if it is a mini-loaf). I made mini-loaves for my friends. 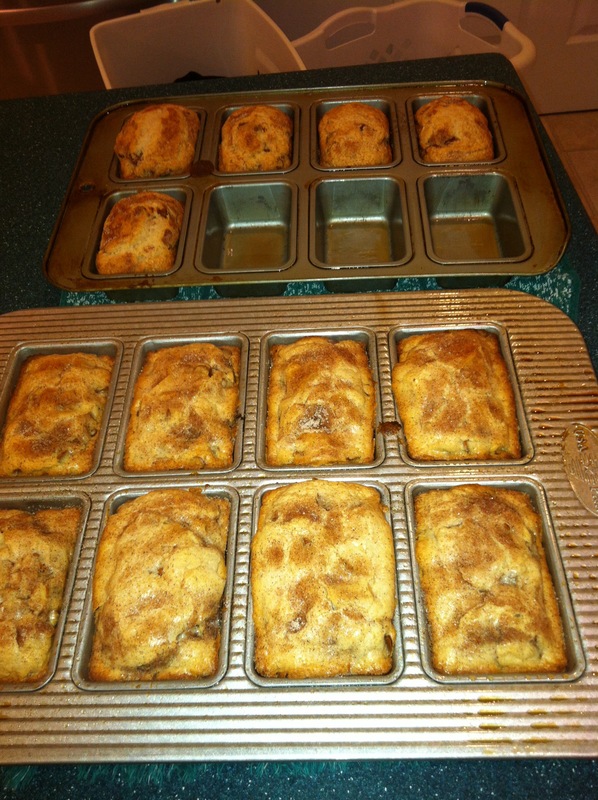 My kitchen smelled so good when they came out of the oven. Of course, the extra loaves are gladly taste-tested by my family. These are for my taste-testers. 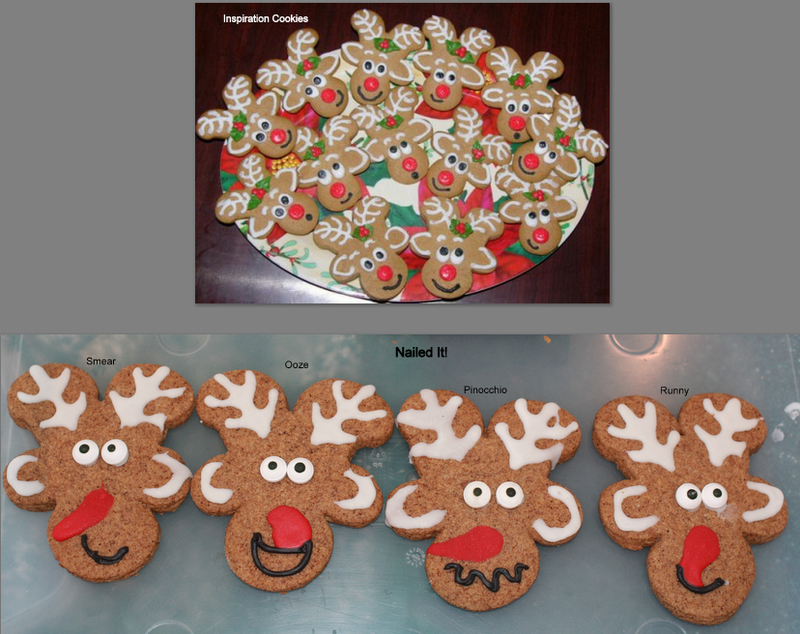 The base is a gingerbread man cookie, just flipped and decorated to look like a reindeer. So, I decided to try my luck at it. 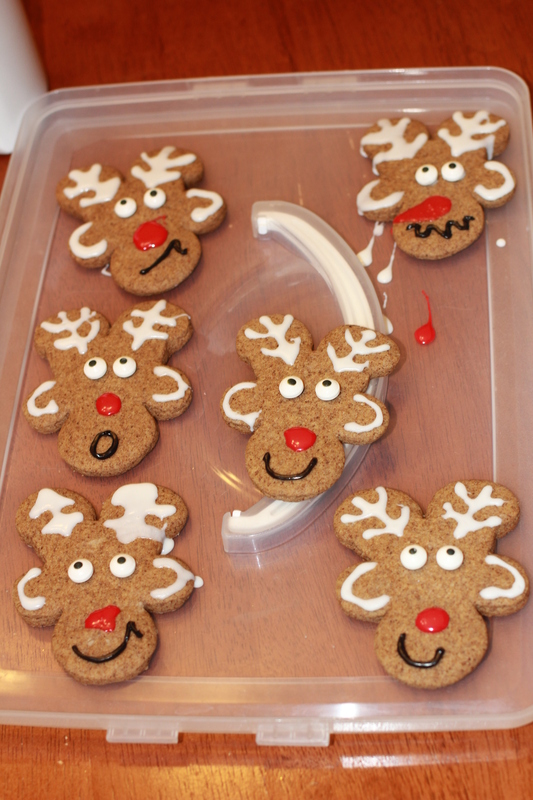 I used cookie icing for the antlers, ears and noses. I purchased the Christmas package at a local crafts store, with white, red, and green icings. You warm it in the microwave to soften it. The only concern here is that you can’t regulate the flow of the icing, like you can when you use a specific tip and piping bag of icing. Also, the warm icing tended too ooze a bit more than I had anticipated. If I do these cookies in the future, I’ll just have red, white, and black icing in piping bags with tips for greater control. I dyed some white icing black, and piped that on for the mouths using just a plastic bag with a small corner cut out. That worked really well (compared to the red and white icing application!). This wasn’t a level surface, which added to the ooze factor. My friends got the versions that did not make it to the “Nailed it” photo. In spite of the way they look — they taste great!